The Bavarian Beer and Food Tasting Tour operates on Tuesdays, Thursdays, and Saturdays from mid-October to March and daily from April to mid-October. This tour departs at 18.00. This tour operates all year but is more frequent in from April to October. 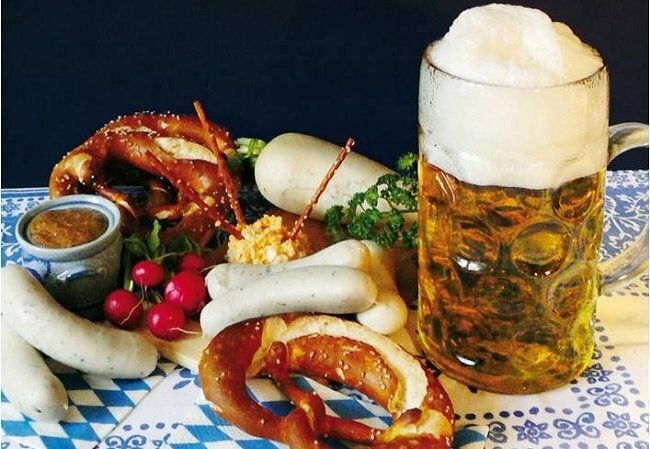 We are comparing Bavarian Beer and Food Evening Tour from Munich Prices from leading ticket suppliers and Try to find you Cheap tickets prices on the market. The German city of Munich is not just the capital of the Bavarian region, but also the well-known capital of beer, home of the world-famous Oktoberfest as well as countless beer halls and breweries. Bavarian's have been brewing beers in this region since the middle ages, so it's no wonder that the craft has been perfected and evolved into an integral part of local culture. On this 3-hour food tasting extravaganza you will be shown to the best taverns and beer gardens, where the Munich's local residents like to spend their evenings. In the company of an excellent English speaking guide you will combine history culture and cuisine. Visit the Oktoberfest museum and hear how this notorious festival first began. Sit alongside locals in one of the cities many beer gardens and taste some of Bavaria's regional foods, from a traditional veil sausage (weisswurst) to obatzda cheese, roasted pork, heavy dumplings and vegetarian options (on request). The grand finally will take you to Hofbrauhaus, the most famous and one of the oldest beer gardens in Munich. Here your city guide will bid you good evening but you have the option to remain with your fellow travellers until closing time. This 3-hour evening tour is ideal for sociable foodies and those interested in the origins of the Oktoberfest, as well as other Bavarian festivals. If you enjoy tasting local foods and beverages while learning a little history then this is the tour for you. Suitable for small groups or couples, as well as solo travellers who can share the experience with other participants. Your Experience With Bavarian Beer and Food Evening Tour from Munich? See the Bavarian Capital from a different perspective, exploring its roots in beer production, the origins of Oktoberfest, and modern-day food culture. Spend an evening sampling a variety of delicious local Beers. Get a taste for Bavarian cuisine such as dumplings, sausages, cheeses, and sharing platters. Sample Bavarian beers and foods in the famous Hofbrauhaus and tour the Beer and Oktoberfest Museum. Benefit from the tips and recommendations of a local city guide and enjoy a sociable evening with fellow travellers. What Bavarian Beer and Food Evening Tour from Munich Includes? Fully guided 3-hour Bavarian foods tour in English. Expert local resident tour guide. Ask your guide for tips and recommendations for restaurants, cafes and bars to visit during your stay in the city. If you're passionate about tasting local cuisine you could purchase a Munich City Card which includes discounts and special offers to multiple bars and eateries across the city. Travelers Reviews about Bavarian Beer and Food Evening Tour from Munich? This 3-hour evening tour has received 5-star reviews from TripAdvisor and Viator users and is one of the bestselling tours on Get Your Guide. Travellers say that the Bavarian Beer and Food Tour is a fun way to combine history with modern culture and an excellent way to meet other travellers. Tickets will be sent via email and either printed or mobile tickets will be accepted. Tickets are non-refundable within 48 hours of tour date. Viator will issue only partial refunds for cancellations made less than 7 days in advance. You should arrive at the Radius Tours office at least 15 minutes in advance. This is a food orientated walking tour so we recommend wearing comfortable shoes and not eating a large meal prior to the tour. Minimum age applies, participants must be at least 14 years old. This tour is not appropriate for bachelor or bachelorette parties. You should advise you tour operator of any dietary requirements in advance, e.g. vegetarians. Meeting Point: Radius Tours Office, opposite tracks 32-34, Munich Central station, Hauptbahnhofplatz.